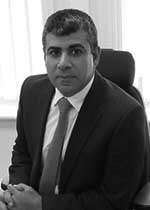 Osama Abu-Ghazza has 16 years of experience in Obstetrics and Gynaecology and is a Consultant Obstetrician and Gynaecologist at Royal Surrey County Hospital. He achieved his Degree in Medicine at Moscow Medical Academy I.M. Secheov First Moscow State Medical University in June 1997 and became a member of the Royal College of Obstetricians and Gynaecologist in November 2005. Mr Abu-Ghazza had his postgraduate training at Imperial Healthcare Trust and has also been awarded a master degree in gynaecological endoscopic surgery from University of Surrey. He has many research publications and is a member the RCOG menstrual disorder study group. Mr Abughazza's special areas of interest include menstrual disorders, reproductive surgery (fibroid and endometriosis), endoscopic & pelvic floor surgery, colposcopy and early pregnancy problems. Mr abu-Ghazza looked at the underlying causes for hysterectomy in England and the trends in changes of the routes to hysterectomy. Fibroids and endometriosis and pelvic pain are currently the main indications for women to have a hysterectomy. There is still a significant number of women could have avoided a longer recovery from an open approach to hysterectomy and could have had their hysterectomy via minimal access routes (vaginal and laparoscopic). Mr Osama Abu-Ghazza does not hold a share or financial interest in this hospital, another Nuffield Health hospital or the company. Mr Osama Abu-Ghazza does not have a share or financial interest in equipment used at this hospital or another Nuffield Health hospital. Mr Osama Abu-Ghazza does not hold any paid advisory role(s) at this hospital or on behalf of Nuffield Health.